Blizzard fans, get ready to shell out some cash- The Art of Blizzard is one mean looking artistic tome. Let's face it, when Blizzard releases a new game, it's pretty much a gamer holiday. Starcraft 2 was a smash and Diablo III (even with the loads of technical issues) has been even bigger- and do I even need mention WoW? This new art book is a compendium of what has to be a good chunk of the art and concept work that has gone into the entire Blizzard library. Through nearly 800 pieces of concept art, paintings, and sketches, The Art of Blizzard explores the creative forces behind the company's games and showcases the artistry of the teams that make them. Commentary on the art is provided by Blizzard Entertainment's own Nick Carpenter, Sam Didier, and Chris Metzen, who've each played important roles in shaping Blizzard's game universes over the years. All that plus behind the scenes info about the company's beginnings and a never (ever!) before seen look at unpublished work from the developer. I don't think it'd be too much of a limb to crawl out on to say that this kind of a thing is pretty much a must have for a die hard Blizz fan. 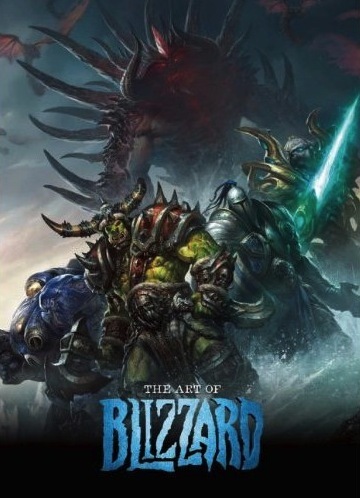 Even though The Art of Blizzard doesn't go on sale until this October (just in time for Halloween- spooky! ), you can guarantee yours by pre-purchasing it at the SDCC. Should you have the good fortune to be able to attend Comic Con International, you'll find this Insight Editions published beauty on hand and all ready to take your cash. 352 pages of Blizzy glory? Yes please.